When AllNetic Working Time Tracker detects that use has started his work, it will propose to start time tracking. 2. Tracking start time (automatically set to the time user activity was detected). 3. Set current time as the tracking start time. 4. 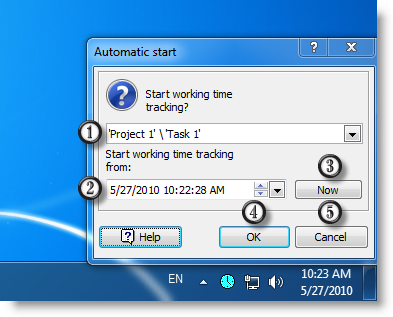 Click OK to start time tracking of the currently selected task starting from the specified time. 5. Click Cancel to abandon time tracking start.